SNAPSHOT versions are used for projects under active development. 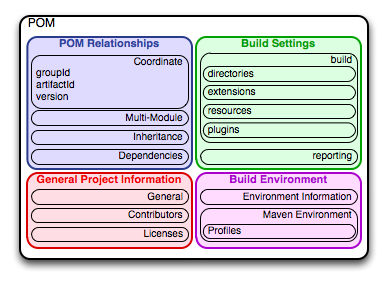 Maven is a project management tool which encompasses a project object model, a set of standards, a project lifecycle, a dependency management system, and logic for executing plugin goals at defined phases in a lifecycle. When you use Maven, you describe your project using a well-defined project object model, Maven can then apply cross-cutting logic from a set of shared (or custom) plugins. COC 最佳实践 共同知识 easonable defaults. Not only folders, plugin..., And can .. customized. The core of Maven is pretty dumb, it doesn’t know how to do much beyond parsing a few XML documents and keeping track of a lifecycle and a few plugins. Maven has been designed to delegate most responsibility to a set of Maven Plugins which can affect the Maven Lifecycle and offer access to goals.